Figure 1: An iconic drawing of the Daedalus animal, as published in The Illustrated London News. This was produced by a professional artist with advice from Captain M’Quhae. Figure 2: Two more drawings (“A” above and “B” below) by M’Quhae’s artist, as as published in The Illustrated London News. Note the ridges on the head. The sea serpent was once little more than a monster of Norwegian folklore. During the nineteenth century, various supposed sightings of the creature—mainly in the Atlantic—lent it some public and scientific credibility as a real animal (Heuvelmans 1968). A particularly influential sighting occurred from the British naval vessel Daedalus in 1848. There is no doubt that something remarkable passed by that ship on an August afternoon, and the Daedalus case has remained one of the most famous and puzzling maritime mysteries. We have the advantage today of greater knowledge of large marine vertebrates than was available at the time, and we have two important contemporary drawings by a Daedalus witness that were not published until 1997. The Daedalus animal can finally be identified. On August 6, 1848, at about 5 pm, the frigate H.M.S. 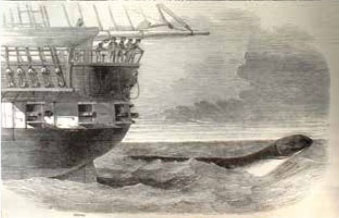 Daedalus encountered what its captain, P. M’Quhae, later described in a published official report (M’Quhae 1848a) as an enormous serpent, at least sixty feet long. This occurred in the South Atlantic, some 300 miles from the coast of present day Namibia. Three professional drawings of the animal (The Illustrated London News 1848; reproduced in Figures 1 and 2 here), authorized by Captain M’Quhae, were published. An excerpt for the day of the encounter from the diary of Lt. E.A. Drummond (1848) was also published, and a correspondent claiming to be an officer of the Daedalus later gave a basically confirmatory account (‘An Officer . . .’ 1858). Finally—and unexpectedly—in 1997, M. Drummond provided drawings (Figure 3) of the creature from Lt. Drummond’s diary, via a communication to The Log of Mystic Seaport (Dash 2010). These drawings provide important clues about the Daedalus animal.
. . . in latitude 24° 44’ S., and longitude 9° 22’ E., the weather dark and cloudy, wind fresh from the N.W., with a long ocean swell from the S.W., the ship on the port tack heading N.E. by N., something very unusual was seen by Mr. Sartoris, midshipman, rapidly approaching the ship from before the beam. . . .
On our attention being called to the object it was discovered to be an enormous serpent, with head and shoulders kept about four feet constantly above the surface of the sea, and as nearly as we could approximate by comparing it with the length of what our maintopsail yard would show in the water, there was at the very least 60 feet of the animal à fleur d’eau, no portion of which was, to our perception, used in propelling it through the water, either by vertical or horizontal undulation. It passed rapidly, but so close under our lee quarter that had it been a man of my acquaintance I should have easily recognized his features with the naked eye; and it did not, either in approaching the ship or after it had passed our wake, deviate in the slightest degree from its course to the S.W., which it held on at the pace of from 12 to 15 miles per hour, apparently on some determined purpose. The diameter of the serpent was about 15 or 16 inches behind the head, which was, without any doubt, that of a snake; and it was never, during the twenty minutes that it continued in sight of our glasses, once below the surface of the water: its colour a dark brown, with yellowish white about the throat. It had no fins, but something like the mane of a horse, or rather a bunch of seaweed, washed about its back. M’Quhae (1848b) later added that the animal had a flat head.
. . . we observed a most remarkable fish on our lee quarter, crossing the stern in a S.W. 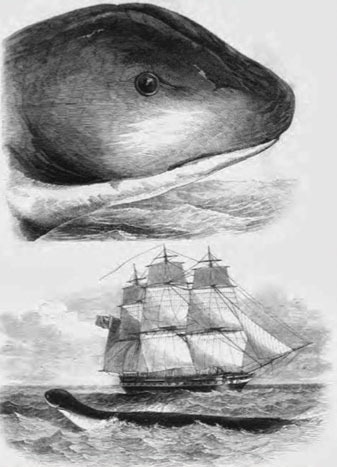 direction: the appearance of its head, which, with the back fin, was the only portion of the animal visible, was long, pointed, and flattened at the top, perhaps ten feet in length, the upper jaw projecting considerably; the fin was perhaps twenty feet in the rear of the head, and visible occasionally: the captain also asserted that he saw the tail, or another fin, about the same distance behind it: the upper part of the head and shoulders appeared of a dark brown colour, and beneath the under jaw a brownish white. It pursued a steady undeviating course, keeping its head horizontal with the surface of the water and in rather a raised position, disappearing occasionally beneath a wave for a very brief interval, and not apparently for purposes of respiration. It was going at the rate of perhaps from twelve to fourteen miles an hour and when nearest was perhaps one hundred yards distant: in fact it gave one quite the idea of a large snake or eel. No one in the ship has ever seen anything similar, so it is at least extraordinary. It was visible to the naked eye for five minutes, and with a glass for perhaps fifteen more. The weather was dark and squally at the time, with some sea running. One Drummond drawing (Figure 3B) includes annotations of a length of seven feet for the visible anterior part of the animal, and of thirty feet for the distance between that portion and the top of the dorsal fin. Note that the “tail, or another fin” shown in the drawing is based on hearsay from M’Quhae. The anonymous ‘Officer’ (1858) wrote that the animal was moving at probably not less than ten miles per hour, that water was surging under its chest, that it was not more than 200 yards away at its closest position, that it was in sight for about ten minutes, and that “the eye, the mouth, the nostril, the colour and form” were all distinctly visible. It should be noted that he was writing nearly a decade after the event, and may have been influenced by the writings and authorized drawings of his captain. Suggestions as to the identity of the Daedalus entity have included an adult of a deep sea teleost fish (referenced to an unnamed source by Cogswell 1848), a land snake swimming at sea (Ibid. ), a surviving plesiosaur (‘F.G.S.’ 1848), an undiscovered chondrichthyan fish (Mantell 1848), more specifically an undiscovered elongate shark (Melville 1848), an elephant seal (Owen 1848), a giant seaweed (The Geelong Advertiser 1849), an oarfish (Hawtaigne 1860), an undiscovered giant eel (Gosse 1864), an undiscovered greatly elongated whale (Gosse 1864), more specifically a surviving zeuglodont (Wood 1880), a giant squid (Lee 1883), an undiscovered long-necked seal (Oudemans 1892), an undiscovered giant salamander (Burr 1934), and an abandoned canoe being towed by a harpooned, submerged whale shark (de Camp and Crook de Camp 1968). None of these authors had access to the revelatory Drummond drawings (Figure 3) that depict a quite long-snouted creature with a dorsal fin. Drummond’s drawings nicely match his description of the animal’s head as “long, pointed, and flattened at the top.” As noted by Dash (2010), the data derived from Drummond’s diary are of particular importance due to contemporaneity. In contrast, M’Quhae’s report was written more than two months later, during which stretch of time memories can change. M’Quhae referred to a sketch made shortly after the sighting, but the iconic drawings in The Illustrated London News were not produced until October, and we do not know to what extent they resemble the original sketch, or how detailed that sketch was. 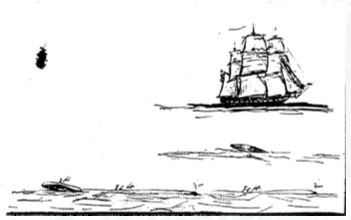 M’Quhae’s account seems to imply that the animal came very close to the ship, as indeed is shown in one of the drawings he authorized (Figure 1). But another of those drawings (Figure 2B), and the accounts of both Drummond and the “Officer,” are in agreement that the animal was much farther away at closest approach. (Drummond wrote that it was perhaps 100 yards away; the “Officer” wrote that it was not more than 200 yards away.) Moreover, there was poor light during the sighting; the weather was described as “dark and cloudy” by M’Quhae and as “dark and squally” by Drummond. Thus M’Quhae’s comment on naked-eye observable detail was surely an exaggeration. Nonetheless, the witnesses had substantial time to view the animal and had telescopes to magnify the view. Drummond did not perceive the expanse of body surface shown in M’Quhae’s drawings (Figures 1 and 2B); rather, he saw the “head, which, with the back fin, was the only portion of the animal visible.” M’Quhae wrote that the animal’s head was never beneath the surface; this is contradicted by Drummond’s statement that the head occasionally disappeared “beneath a wave.” But their accounts agree that the animal was swimming along with its head fully out of the water much of the time. This behavior is not typical of large marine vertebrates swimming in the open ocean. Figure 3: Drawings (“A” above and “B” below) of the Daedalus animal from the diary of Lt. Drummond, as published in The Log of the Mystic Seaport. Note the long, flat head. Figure 4: A sei whale in lateral view during surface skim feeding, from website Shetland Environment. Note similarity in profile to the Daedalus animal as depicted by Drummond. This photo was taken by George Graham and is his intellectual property. 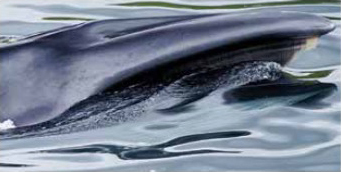 Figure 5: The same sei whale viewed from behind, from website Shetland Environment. Note the ridges on the head. This photo was taken by George Graham and is his intellectual property. Figure 6: The same sei whale in lateral view during skim feeding, from website Shetland Environment. Note the long, flat upper head. This photo was taken by George Graham and is his intellectual property. But suppose that what seemed to be the whole head was actually only partial, with the mouth open and the lower jaw underwater. Some baleen whales swim in this manner while skimming small organisms from the ocean surface; the whale’s body and lower jaw are beneath the surface, while the upper jaw projects at an angle. In true skim feeding, at or below the surface, there is unidirectional water flow between the two baleen racks (located beneath the upper jaw) over much of their length, with filtration by baleen bristles, and with outward water flow between baleen plates. In the Daedalus case, the baleen, or part thereof, may have been mistaken for the lower jaw. Drummond mentioned, and illustrated (Figure 3A), that the apparent upper jaw was overshot, which can also be seen in M’Quhae’s close-up view (Figure 2A). This aspect conforms nicely to the relationship between the tip of a whale upper jaw and the forward limit of the baleen beneath it (Figure 4). Perhaps, then, the Daedalus creature was a rorqual baleen whale feeding at the surface. It is easy to understand how the flat, triangular rorqual upper head (Figures 4 to 6), with its more reptilian than mammalian general appearance, could have been mistaken for the head of a snake by M’Quhae. And his conviction that the animal was a snake may have influenced aspects of his artist’s drawings (Figures 1 and 2). The snake-like eye depicted may have been based on some blemish or shadow effect seen on the whale’s head; the real eye would have been located at the extreme lateral extension of the head, and often underwater. On the other hand, M’Quhae may have glimpsed the real eye, without accurate clarity as to its placement. M’Quhae’s close-up of the head (Figure 2A) depicts a ridge that seems to run parallel to the midline anteriorly and then splits posteriorly into two branches, producing a Y shape overall. This ridge (actually located right on the midline) is found in rorquals, the blowholes being located within the two angled posterior branches (Figure 5). No spouting was mentioned by the Daedalus witnesses. However, exhalation during surface skim feeding can produce merely a low cloud of droplets, potentially mistakable for spray from movement or from wave impact. The rather different Drummond and M’Quhae depictions of the Daedalus animal can be reconciled reasonably under the rorqual hypothesis. In lateral profile in surface skimming stance (Figures 4 and 6), a rorqual upper head looks long, flat, and pointed, greatly resembling Drummond’s contemporary drawings (Figure 3). But when seen from behind (Figure 5), as when the Daedalus animal was moving away from the ship, a rorqual upper head can look relatively short and blunt, and somewhat constricted at the back, a perspective that may have influenced the later M’Quhae depictions (Figures 1 and 2). Can the type of rorqual seen from the Daedalus be identified? One species should be considered mainly due to the shape of its dorsal fin. M’Quhae mentioned a seaweed-like mane on the Daedalus animal (reminiscent, notably, of the sea serpent’s mane in Norwegian folklore), and his artist depicted (Figures 1 and 2B) two low, narrow ridges of shaggy material, one being located at the posterior end of the visible part of the creature. Drummond referred to an occasionally visible “back fin” presumably corresponding to the more anterior ridge shown by M’Quhae’s artist, and drew this (Figure 3B) as a low dorsal fin with a gently concave rear edge. The fin drawn by Drummond is most similar to the “stepped” dorsal fin of the humpback whale (Megaptera novaeangliae), a species that could easily have been present in early August at the Daedalus location. There are, however, difficulties in attempting to identify the Daedalus animal as a humpback. The large sensory nodules adorning the head seem unlikely to have gone unnoticed (though one of them could have been mistaken for an eye). The behavioral difficulty is greater. Humpbacks consuming fish have been observed slowly and briefly moving forward with the upper jaw above the surface and the mouth widely open (Stamation et al. 2007). But a humpback moving steadily for a lengthy period, in a position like that of the Daedalus animal, would seemingly have been engaging in maladaptive behavior. The baleen racks, with their relatively short plates, would have been largely out of the water, ruling out true surface skim feeding on tiny organisms. Perhaps a humpback was engaging in anomalous behavior that day in 1848, but the humpback is not the preferred candidate for the Daedalus creature. Happily, there is a rorqual species of appropriate size and color that possesses an appropriately contoured head, that sometimes engages in steady surface skim feeding, and that could easily have been present at the sighting location in early August: the sei whale (Balaenoptera borealis). The sei (pronounced “say”) whale has anatomical adaptations for opportunistically feeding in skimming mode (Brodie and Vikingsson 2009). The typical angle the upper head makes with the ocean surface during surface skim feeding (Figures 4 to 6) is that drawn by Drummond (Figure 3) for the Daedalus creature. The sei is a slender whale, usually between forty and fifty-five feet in length when fully grown, and dorsally mainly gray to dark brown in color. Most of the baleen plates are mainly dark (Figure 4), but many can be distally whitish, and all the bristles are whitish or white, which explains the reported color of the underside of the Daedalus creature’s “under jaw.” M’Quhae, at least, seems to have taken the darker proximal parts of the plates to have been part of the upper jaw. A sei whale usually possesses a sickle-shaped dorsal fin, small but prominent. The dorsal fin (unlike the head) of the Daedalus animal was only occasionally visible, and viewing conditions were far from ideal; perhaps only the tip of the fin was dragging at the surface, making its shape difficult to ascertain. Alternately, the fin may have been in damaged or otherwise unusual condition. An interesting photograph (Engblom 2011) shows a possible sei whale with a low, flat dorsal fin. Many baleen whales bear damage of one sort or another from past orca attacks. If a more stereotypical cetacean dorsal fin had been noted, perhaps the Daedalus whale would never have been reported as a giant serpent. A classic maritime mystery seems solved: The animal seen from the frigate Daedalus on that fateful winter day in 1848 was almost certainly a rorqual whale feeding at the surface with its mouth open. That would presumably constitute a puzzling sight for many mariners of either the nineteenth or the twenty-first century. This research has involved a confluence of mystery investigation and science. It is therefore particularly appropriate to dedicate this paper to my mother, Ruthie E. Weber Galbreath, who loved mystery stories and their solutions, and to my father, Donald H. Galbreath, a fine engineer with scientific training. I thank the noted natural history writer Sy M. Montgomery for comments on the evolving manuscript. The wonderful sei whale photographs in Figures 4 to 6 were downloaded from Shetland Environment (shetlandenvironment.createaforum.com); they are the intellectual property of the photographer, George Graham. ‘An Officer of Her Majesty’s ship Daedalus.’ 1858. The Times (February 16). Brodie, P., and G. Vikingsson. 2009. On the feeding mechanisms of the sei whale (Balaenoptera borealis). Journal of Northwest Atlantic Fishery Science 42: 49–54. Burr, Malcolm. 1934. Sea-serpents and monsters. Nineteenth Century 115(684): 220–230. Cogswell, C. 1848. Pages 2316–2323 in “The Great Sea-Serpent” section, edited by E. Newman, The Zoologist 6: 2306–2324. Dash, Mike. 2010. Our artist pictures what the witness saw . . . Dry as Dust. A Fortean in the Archives. A Charles Fort Institute Blog (May 24). Online at blogs.forteana.org/node/121. de Camp, L. Sprague, and Catherine Crook de Camp. 1968. The Day of the Dinosaur. Modern Literary Editions Publishing Co., New York. Doyle, Arthur C. 1902. The Hound of the Baskervilles. George Newnes, Ltd., London. Drummond, Edgar. 1848. Pages 2306–2307 in “The Great Sea-Serpent” section, edited by E. Newman, The Zoologist 6: 2306–2324. ‘F.G.S.’ 1848. Page 2311 in “The Great Sea-Serpent” section, edited by E. Newman, The Zoologist 6: 2306–2324. Gosse, Philip H. 1864. The Romance of Natural History. Gould and Lincoln, Boston. Hawtaigne (Captain). 1860. A sea serpent in the Bermudas. The Zoologist 18: 6934–6935. Heuvelmans, Bernard. 1968. In the Wake of the Sea-Serpents. Hill and Wang, New York. Lee, Henry. 1883. Sea Monsters Unmasked. William Clowes and Sons, Ltd., London. Mantell, Gideon A. 1848. Page 2310 in “The Great Sea-Serpent” section, edited by E. Newman, The Zoologist 6: 2306–2324. Melville, A.G. 1848. Page 2310 in “The Great Sea-Serpent” section, edited by E. Newman, The Zoologist 6: 2306–2324. M’Quhae, Peter. 1848a. Pages 2307–2308 in “The Great Sea-Serpent” section, edited by E. Newman, The Zoologist 6: 2306–2324. 1848b. Pages 2323–2324 in “The Great Sea-Serpent” section, edited by E. Newman, The Zoologist 6: 2306–2324. Oudemans, A.C., Jr. 1892. The Great Sea-Serpent. E.J. Brill, Leiden, Netherlands. Owen, Richard. 1848. The great sea-serpent. Pages 2312–2316 in “The Great Sea-Serpent” section, edited by E. Newman, The Zoologist 6: 2306–2324. Stamation, Kasey A., David B. Croft, Peter D. Shaughnessy, et al. 2007. Observations of humpback whales (Megaptera novaeangliae) feeding during their southward migration along the coast of southeastern New South Wales, Australia: Identification of a possible supplemental feeding ground. Aquatic Mammals 33(2): 165–174. The Geelong Advertiser. 1849. The great sea snake. In The Geelong Advertiser 9 (1015). Geelong, Victoria, Australia. The Illustrated London News. 1848. The great sea-serpent—evidences of the former appearances of the sea-serpent—the great American sea-serpent. (October 28). Wood, Searles V., Jr. 1880. Order Zeuglodontia. Nature (November 18).